Vibration-insensitive measurement enables use in challenging environments such as cryo-vac testing or over long measurement paths. The design can be extremely compact, enabling use in tight spaces, or in difficult-to-access locations. The on-axis design provides excellent accuracy, particularly when measuring spherical elements. PhaseCam dynamic Twyman-Green laser interferometers provide high resolution measurements despite vibration and air turbulence. Dynamic Interferometry® enables PhaseCam laser interferometers to capture full wavefront measurements in as little as 30 microseconds—5000 times faster than conventional phase shifting interferometers. Compact and lightweight, PhaseCams make reconfiguring test setups simple and easy, without vibration isolation. Because of the capabilities of Twyman-Green interferometry, PhaseCam laser interferometers are perfect for metrology of large diameter optical components, production floor quality control, clean room applications typically hampered by air flow turbulence, environmental chambers where remote operation is essential, and modal analysis of moving parts, such as deformable mirrors, spinning disks, or vibrating membranes. With an easy-to-position, fiber-coupled measurement head and motorized controls, the incredibly small PhaseCam 6100 is ideal for long path measurements, remote mounting in measurement towers or pressure vessels, and other challenging test setups. With an easy-to-position, fiber-coupled measurement head and motorized controls, the PhaseCam 6000 is ideal for on-machine metrology, remote mounting in measurement towers or pressure vessels, and other challenging environments. PhaseCam 6000 is a Twyman-Green interferometer. The PhaseCam 5030 dynamic laser interferometer can be completely controlled remotely, with remote-operated zoom, focus, beam ratio adjustment, aperture block and reference beam block. Optional extended cables provide easy operation in measurement towers, environment chambers, etc. 4 megapixel camera with 2X zoom, or 1 megapixel with 3X zoom. The PhaseCam 4020 is a compact and lightweight laser interferometer, with simple, manual controls for testing focal optical systems such as large concave telescope mirrors and lens systems, and for multi-segment mirror alignment. It can also be used to test smaller afocal components such as flat mirrors and collimators. The PhaseCam 4020HP dynamic laser interferometer includes a high power, 25 mW HeNe laser for low reflectivity (<1%) measurement setups, such as measuring aspheres using Computer Generated Holograms (CGHs). PhaseCam NIR near infrared laser interferometers are compact, lightweight and vibration-insensitive for accurate surface and wavefront measurements at near infrared (1.053, 1.064, 1.3 and 1.55 micron) wavelengths. PhaseCam SWIR laser interferometers are compact, lightweight and vibration-insensitive for accurate surface and wavefront measurements at 1.55 micron wavelengths. 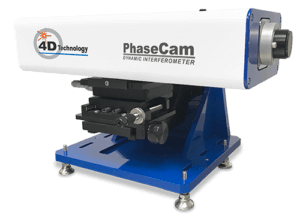 4D Technology's PhaseCam IR laser interferometers provide accurate surface and wavefront measurements at 3.39 micron wavelength—optical metrology using Twyman-Green interferometry at in the infrared range of the spectrum. PhaseCam IR systems employ Dynamic Interferometry® to acquire measurement data in less than 1 millisecond. Because acquisition time is so short, the instruments can measure accurately despite vibration and air turbulence. The systems can be used in demanding environments such as clean rooms or the production floor. These dual-mode systems can also operate using traditional, temporal phase-shifting. Turnkey PhaseCam IR systems include 4Sight™ advanced wavefront analysis software, providing extensive 2D and 3D analysis and visualization tools, as well as comprehensive filtering, masking, database and import/export functions. PhaseCam IR systems are ideally suited for quality verification of IR optics, including focal optical systems and afocal components. The systems use infrared laser light sources in a Twyman-Green configuration. 4D offers a comprehensive line of diverging lenses, mounts, reference optics and other accessories to ease optical setup time and help you make the most of your laser interferometer investment.